Our Lady and St Patrick's has a ramped entrance at the rear of the church. Our lady and St Patrick's has an induction loop system fitted. 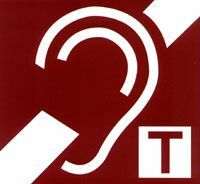 Please set hearing aids to the 'T' position. The Toilet has disabled access and is located at the rear of the church on the left as you enter. We appologise that large print hymn books are not available. Please forward any suggestion on how we can improve our facilities to the Parish Pastoral Team.